Other names: Chinese bayberry, Chinese strawberry tree, Chinese treeberry, Japanese bayberry, red bayberry, yumberry. 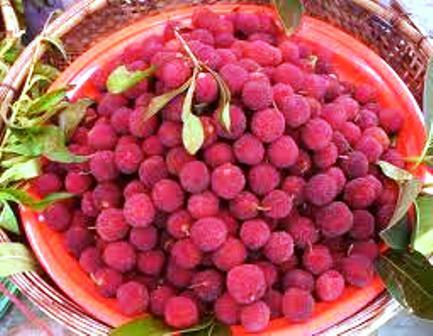 Bayberry is a subtropical tree grown for its sweet crimson to dark purple-red fruit in China, Japan and Korea. It is not known much in outside world. It is native to eastern Asia, mainly in China, where it has been grown for at least 2000 years, and probably also Japan and Southeast Asia as well. It is fruit of considerable economic importance in area south of the Yangtze River, where it is of considerable economic importance. It is the second most important fruit, next to citrus, in Zheijiang Provice of China. 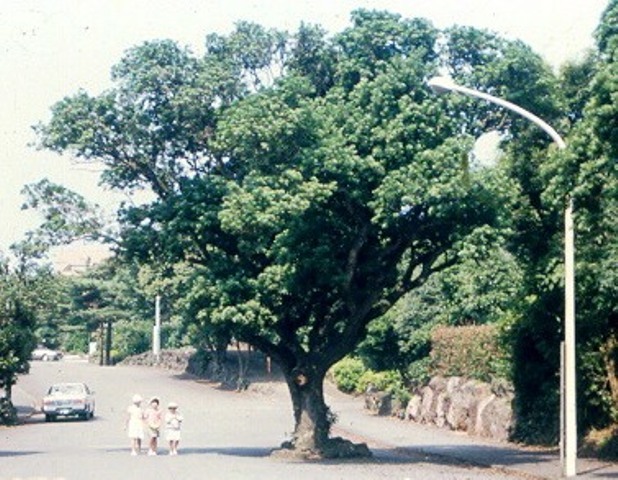 Bayberry is a small to medium-sized tree growing to 10-20 m in height, evergreen, with smooth gray bark and a uniform spherical to hemispherical crown. It is dioecious, with separate male and female plants. It tolerates poor acidic soils. The root system is shallow (5–60 cm), with no obvious taproot. The fruit is spherical, 1.5-3.0 cm in diameter, with a knobby surface. The surface color is typically a deep, brilliant red, but may vary from white to purple depending upon the stage of maturity. The flesh colour is similar to surface color, or somewhat lighter. The flesh is sweet and very tart. At the center is a single seed, with a diameter about half that of the whole fruit. The fruits of cultivated varieties may weigh upto 10-15 g each. The abundant juice plus high sugar content in a good balance with moderate acids makes the fruit a delicious taste. It is also rich in vitamins C.
The fruit is eaten fresh and is also processed into sweets, jam, juice and wine. It is also canned in syrup. 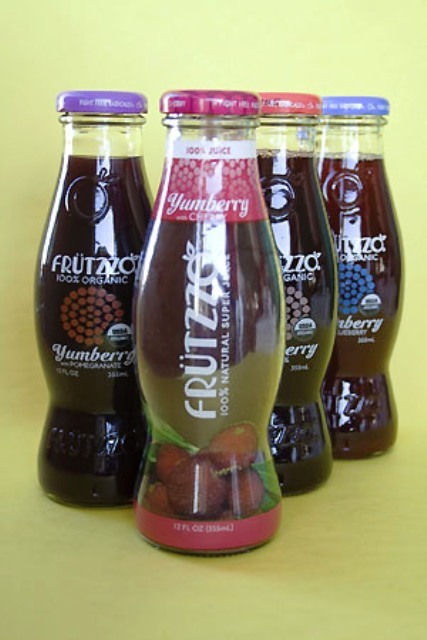 Bayberry juice (called Yumberry) is already being marketed under the brand name Frützzo in New York city and 12 ounce bottle is sold for US$3 to 3.50. Bayberry has many varieties differing in fruit size, color and ripening date. In China, the stem bark is used as a wash in the treatment of arsenic poisoning, skin diseases, wounds and ulcers. The fruit is carminative, pectoral and stomachic. The seed is used in the treatment of sweaty feet. The plant is used in the treatment of cholera, heart ailments and stomach diseases. A yellow dye is obtained from the plant. 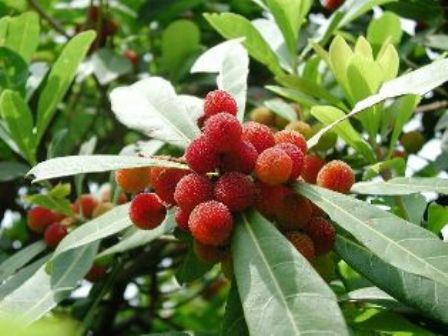 Bayberry is already a popular fruit in China, Japan and some South East Asian countries. It is matter of surprise that how the commercial cultivation of this fruit has not been started in other countries. It needs to be promoted. There is, however, only one small drawback in this fruit. It does not keep very long and has to be used 2-3 days. But this should not deter potential growers in taking up bayberry cultivation on commercial scale.